Barely three weeks since the closing of the vast retrospective of Friedensreich Hundertwasser’s early works (1949-1970) in the Kunsthalle Bremen, Belvedere opened an exhibition of Artist’s works in The Orangerie that has only one thing in common with the Bremen show – namely, it is concerned with the same period of Hundertwasser’s achievements. As one of the curators Harald Krejci puts it, Belvedere is not concerned with the chronology, rather with Hundertwasser’s specific relation to Japan and the artists of the avant-garde. His work is exposed within international context, being displayed side-by-side with twenty works of Yves Klein, Pierre Alechinsky, Akira Kito, Lucio Fontana, Constant, Jean Dubuffet, René Brô, Sam Francis, Piero Manzoni, Arnulf Reiner, Mark Tobey and John Cage, to name some. 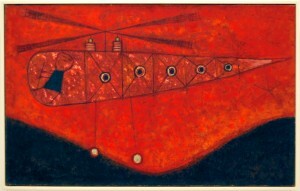 It is no news that the painter was under great spell of the Eastern philosophy and art that initiated his transautomatic painting, besides being a relentless campaigner for the independence of Tibet, and having spent very productive seven month in Japan in 1961; yet, this is the first exhibition that touches such specific aspect of his creativity. Some of the modern art critics do have certain problem with Hundertwasser’s motley aesthetics which, to put it bluntly, resulted in a mass-manifacture of best-selling kitsch products & trinkets (following the fate of Keith Haring and – to some extent – that of Andy Warhol). From the architectural point of view, the critical voices rise for an octave in refuting his eccentric abhorrence of the straight line, impracticality of bauble-floors and parrot-like colouring of façades, but receding down as soon as one mentions Hundertwasser’s ecological awareness. One just has to be reminded of such features as the forested roofs, the usage of recycled materials and special patent-protected solution of the compost humus toilets (which in time started being commercialised by a licenced Swedish company). The Belvedere rehabilitates the repute of the best-known Austrian artist of the post-war period by lifting the burden of the commercial super-star of his shoulders. Although nobody challenges the ingeniousness of his marketing self-promotion and networking (he was already highly ranked at the international market in the 1950’s), the exhibition that shall be opened until June 30th demonstrates, as Belvedere Director Agnes Husslein-Arco puts it, the fact that Hundertwasser was much advanced in respect to his times and that he should be credited as somebody that, by his painting, social interventions, political courses and writings, acted as a sort of precursor of the international Avant-Garde of the late 1960’s. 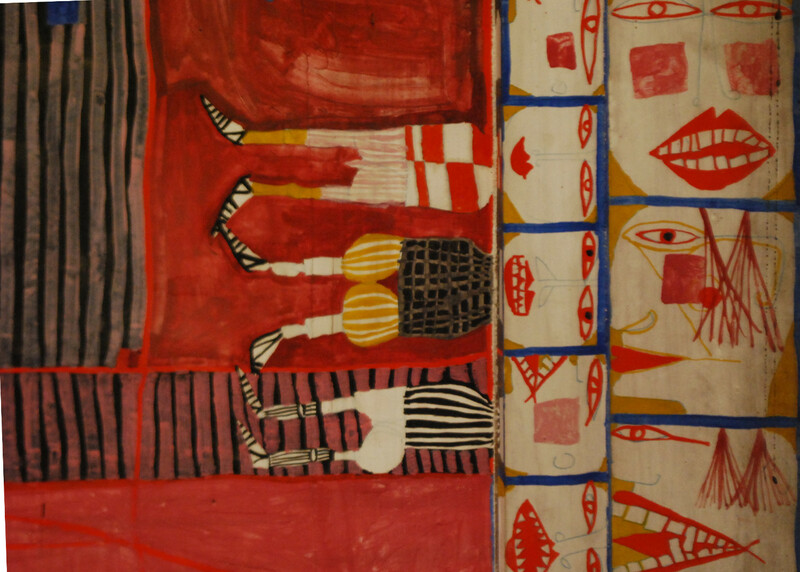 Owing to borrowings from private collections, items from the Hundertwasser Foundation and to the support of artist’s dowager (Japan artist Yuko Ikewada), the exhibition offers a plethora of surprises. One of them is rarely publicly displayed “Chequered self-portrait” (casein, charcoal, oil and watercolours, on the fibre-board in 1950), which owes its name to the fact the surface was initially divided by sharp instrument engraving into uneven rectangles, prior to application of colours. While the attention of Japanese artists in 1950’s was turning towards Europe and USA, on these two continents the interest inversely was raising for traditional segments of the Japanese culture, especially calligraphy, tea-ceremonies, horticulture, architecture and interior design, to say nothing of Zen interpretation of Mahayana Buddhism. 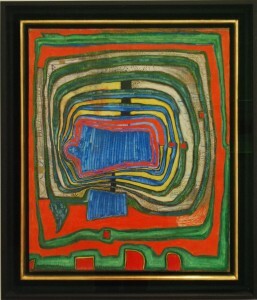 Hundertwasser was in Paris at that time, profiting from his friendship with the gallerist and art critic Michel Tapié, who introduced him to the resident Japanese artists: Akira Kito, Shinkichi Tajiri, Yasukazu Tabuchi, Kumi Sugay and the founder of the Gutai performance collective Jiro Yoshihara. Hundertwasser was invited to Paris by the French painter René Brô, who introduced him to John Cage and Yves Klein. The four of them, together with members of the group “Cobra”, were enthusiastic for the oriental culture and started immersing into techniques of meditation, calligraphy and Buddhism. 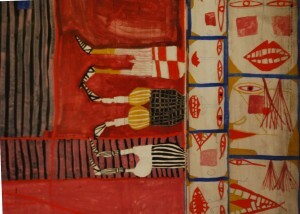 “Hundertwasser was fascinated by Japan because the nature and the culture are not separated there. Spiritual and daily life are inextricably interconnected”, claims curator Harald Krejci.